STMicroelectronics Showcases Solutions For Smart Driving At AUTOMOTIVE WORLD 2018 - The Independent Global Source for the Flexible and Printed Electronics Industry. ST will showcase solutions for Safer, More Connected, and Greener automobiles. STMicroelectronics will exhibit its latest semiconductor solutions for smart driving at AUTOMOTIVE WORLD 2018, Jan 17-19, 2018 at Tokyo Big Sight. The automotive industry is witnessing rapid advances in the development of leading-edge technologies such as autonomous driving, advanced driver-assistance systems (ADAS), vehicle-to-everything (V2X) communication, and power management in electric vehicles (EVs). The ST booth will showcase numerous solutions that combine wide-ranging technologies and products for Safer, More Connected, and Greener automobiles. Achieving “Safer” automobiles based on autonomous driving and ADAS requires advanced sensing technologies. ST will conduct demonstrations of automotive CMOS image sensors equipped with a combination of high dynamic range (HDR) functions and LED flicker-free functions for use in image-processing systems such as electronic mirrors and surround view. These sensors are important because, although traffic signals, road signs, and automobile LED lights appear to the naked eye to be constantly lit, they actually flicker, which conventional image sensors capture. This flicker can hinder automotive systems that use image processing. 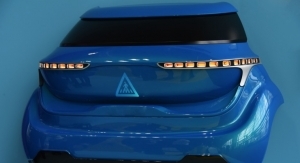 In addition, ST will showcase its MEMS motion sensors, which can be used in automotive applications including navigation, dashboard camera, and smart keys, as well as a widely anticipated image processor. The increasing proliferation of connected cars with in-vehicle communication networks, as well as connections to the outside world through smartphones, roadside infrastructure, and even the cloud is the backdrop for a cooperation with an Israeli company, Valens. While the shift to “More Connected” automobiles brings increased convenience, it also increases security concerns, including data theft or unauthorized access. The ST booth will conduct a demo of an automotive-grade TPM (Trusted Platform Module) security chip that compensates for vulnerabilities in connected cars. In the field of “Greener” driving, the shift to electric vehicles (EVs) is accompanied by demands for more advanced and efficient power-control technologies. At the booth, ST will show an automotive power semiconductor that makes use of SiC (silicon carbide), a next-generation semiconductor material.